Biles, Douglas, Raisman: Who Will Shine at U.S. Olympic Women's Gymnastics Trials at SAP Center? Fourteen women will compete in the U.S.A. Women's Gymnastics Olympics Trials this weekend, but only five will balance, tumble and leap their way into Rio. "I've never been to Rio so I'm excited," Douglas told reporters during an interview Thursday. The reigning Olympic all-around champion who won silver behind Biles at the 2015 World Championships added, "I've gained a lot of experience and learned a lot and matured over the years and so far I’m feeling good, body’s feeling good, mentally feeling good. I’m ready." The 20-year-old continued: "Nothing's really handed out and nothing's really guaranteed, and so for us, we just want to go out there and do our best." The competition comprises two full days of competitions: On Friday at 5:30 p.m. and Sunday at 5 p.m. Both events are sold out. The Olympic gymnastics team is expected to be announced around 7:45 p.m. Sunday. 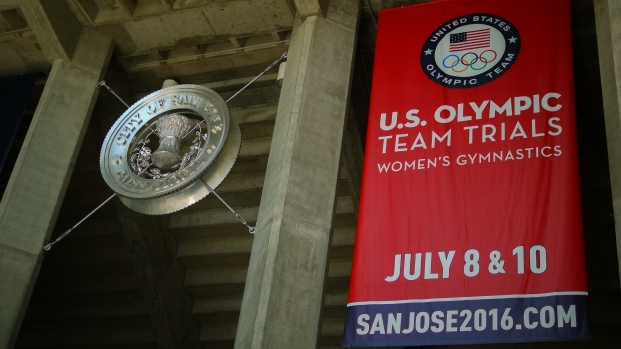 This is the first year since 1976 that two separate U.S. Olympic Gymnastics Trials are being held, according to NBC. The all-around champion — the athlete with the highest combined score over two nights of competition — at the upcoming trials automatically lands a spot on the Olympic team. In 2012, that was Douglas. This year, gymnast observers say, Biles is a standout as she hasn’t been defeated once during all-around competitions in the last three years. Douglas readily admits that the pressure is intense when faced with another shot at her Olympic dream. "Everything else will come later," she said. "If you just do what you need to do, then you’ll be fine." On Thursday, Douglas practiced alongside her friends and fellow competitors. "If they do a good job, I say, 'It’s time for you to do a great job,'" she said. The other four spots on the team will be filled based on a number of factors, including the 13 remaining gymnasts' scores, consistency, presentation, physical ability, and readiness. Biles, 19, said Thursday that "Olympics" is the one word that motivates the gymnasts and keeps them on their toes. "Just speaking about the Olympics gives everyone chills, so we try not to think about it," she said. So what does Biles think about when she’s tumbling? "It kind of feels like we’re flying in a way, but we’re in total control of everything that we do," she replied. When asked who she thinks will make the final five, Biles said, "No, I would never want to say because ... it's scary." She was sure, though, that "any team" selected by Martha Karolyi, the U.S. women’s gymnastics National Team Coordinator "would go out and represent us very well." The Olympic Selection Committee will also consider performances by Brenna Dowell, Rachel Gowey, Laurie Hernandez, Madison Kocian, Maggie Nichols, MyKayla Skinner, Christina Desiderio, Ragan Smith, Amelia Hundley, Ashton Locklear, and Emily Schild. In the run-up to the trials, Dowell was a blur of pink as she practiced her floor routine, Hernandez and Douglas flipped dizzyingly over the uneven bars, Kocian worked on her double squat turn, Biles warmed up on the vault and, when she wasn't practicing herself, Raisman cheered on her teammates. "God willing, I make the Olympics, it would be such an honor to be the first Latina gymnast to go from USA," said 16-year-old Hernandez. "They have a lot, a lot of experience. I hope they see I fit in with them too." For her part, Ragan, who is 15 years old and beat 22-year-old Raisman to take the balance beam gold medal at the 2016 Pacific Rim Championships, said she doesn't really stop to think about her age. What matters is "if you're ready or not" and if you "can take the pressure," she said. "I think I can," Ragan said. The youngest member of the U.S. National Team also reiterated: "I just want to show that I'm ready, and just have fun and just go for 100 percent, and just do [the] very best I can." While Karolyi watches each gymnast compete Friday and Sunday, Olympic veteran Raisman plans to draw strength from the crowd at SAP Center. "Everyone is going to be chanting USA! It’s going to be incredible," she said.